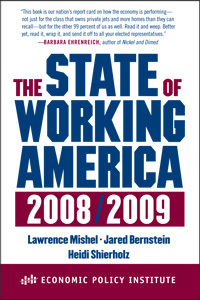 Released in time for Labor Day, the advanced edition of EPI's authoritative volume The State of Working America 2008/2009 is now available. Described as the "most comprehensive independent analysis of the U.S. labor market" by the Financial Times, the 11th edition shows that the business cycle that started in 2001 will be one for the record books. In fact, for the first time on record, middle-class families are at the end of a recovery without ever having regained the ground they lost during the previous recession. Gross domestic product and historically high productivity growth should have raised paychecks up and down the income ladder, but instead the benefits of that growth have bypassed most of the people who made it possible. Prepared biennially since 1988, The State of Working America scrutinizes family incomes, jobs, wages, unemployment, wealth, poverty, and health care coverage, describing the economy's effect on our nation's standard of living.